Are you up for the 30-hour challenge? 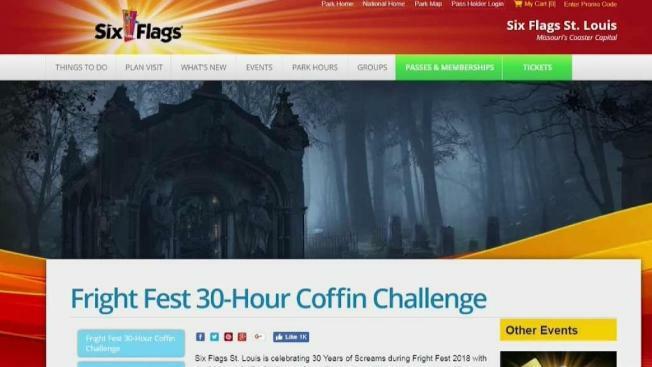 Six Flags in St. Louis, Missouri, is challenging six contestants to spend 30 hours inside a coffin for a chance to win $300 during the park's annual spooktacular Halloween event. Participants of the ghoulish contest to celebrate the 30th year of Fright Fest will bide their time inside 2-by-7-foot coffins at the park from 1 p.m. Oct. 13 to 7 p.m. Oct. 14. Coffin dwellers will be allowed to bring a friend during Fright Fest operating hours, "but they must brave the non-operating hours alone,” according to the contest's rules. Contestants will also get brief hourly bathroom breaks and in-coffin meals. Those who complete the macabre challenge will win two 2019 Gold Season Passes, a Fright Fest prize package including two VIP Haunted House passes, and a ticket for two to ride the Freak Train for Freaks Unleashed. If more than one person makes it to 30 hours, a drawing will determine who gets the $300. One more perk: Successful coffin dwellers get to keep their casket. Six Flags will choose the six participants on Oct. 4 and nominees must accept by Oct. 6. If all coffins are not filled, alternates will be notified by Oct. 8. Click here to register. The deadline to register is Oct. 3 at midnight.